Magnolia High School Center for Excellence Phase 1 Classroom Building. The Anaheim Union High School District recently founded the first public high school level cyber security program in the nation on this campus. The middle school (or “junior high school”) I attended in northern California was a poured-in-place concrete 1920’s era Spanish mission style number with loggias and courtyards. It was grand and for us middle class suburban kids even a little bit exotic. We all felt special going there. The monumental Fredrick Law Olmsted designed campus where I went to college made me feel valued, like I was somewhere important. And the modest yet somehow grand Georgian architecture where I went to graduate school made me feel as if I were part of something bigger—the arc of history and the culture of this nation. Vallejo Junior High School was torn down in the 1970s and replaced with a series of single story concrete block bungalows. The 1960s era library where most of us studied on that Olmsted designed campus was called UGLY (“UnderGraduate LibrarY”). Notoriously disliked by about everyone who ever encountered it, the university recently tore it down. All our library projects over the last decade replaced mid-century bunkers (mostly with no windows) that had proliferated across Southern California in the 60s, 70s and 80s. What happened? Vallejo Junior High School where I went to school in the 1960s. It was built in the 1920s and torn down in the 1970s. America’s good at luxury. There is plenty of talent out there to indulge every desire of all those Americans with the money to spend. We’ve got the best master bathrooms in the world. And, there are plenty of Americans with no money at all. Here in Los Angeles we have what everyone calls a “homeless” crisis. People with no resources living on the street. We talk about the great wealth divide and the evisceration of the middle class. Architects of talent have been addressing this issue too—shelters for the homeless--in sometimes creative and interesting ways. These architects are often the same ones who design houses for the privileged. To what end do we engage in all this activity? What in the long term do we achieve by creating homes for the affluent and shelters for the homeless? What are we doing? 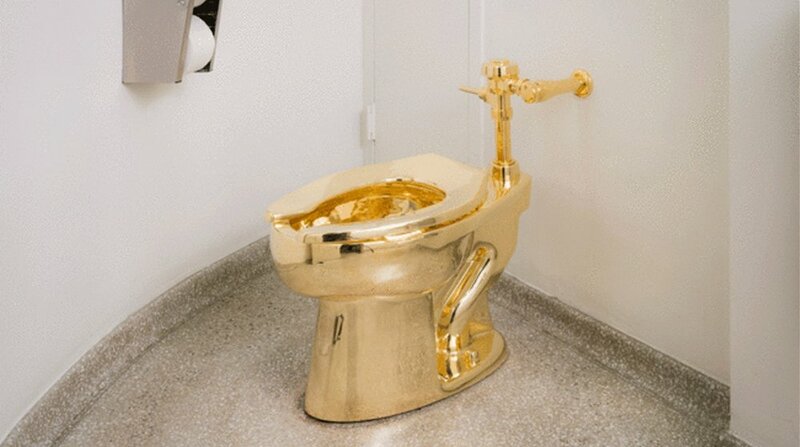 The Guggenheim Museum of New York has installed this piece, a gold plated toilet by the Italian artist Maurizio Cattelan in one of its restrooms. America’s also good at war. According to Brown University the United States spent (at least) $2 trillion on the Iraq war. In 2007 the Washington Post reported that the United States was spending $720 million a day there. Then we put $212 billion into the reconstruction of Iraq which by all accounts was a failure. Most experts say that we will continue to bear the costs of the Iraq and Afghanistan wars for decades to come. On top of that we will spend billions every year maintaining and upgrading our global military arsenal. We have and will always have the best ballistic missiles in the world. Mine is not a political statement, nor would I presume to know all that has to be known in deciding how and where to spend our resources as a nation. Nor is this an argument for taking money from the wealthy (or wars) only to then give it to the poor. But we do have resources as a nation and our past is proof. What I question is: what as a society do we value? How do we prevent people from becoming destitute or homeless in the first place? At least part of the answer (at least for us) is clear: free schools and free libraries. Education can be a ticket out of poverty, a way to rebuild the middle class and maybe the key to our strength as a nation (certainly our democracy). Magnolia High School Center for Excellence Phase 1 Project Based Learning Center. This facility will allow public high school students to present prototype inventions in robotics, drone technology, node energy production and manufacturing technology. Five years ago we were engaged by the Los Angeles Unified School District along with a lot of other architects in Los Angeles to create master plans for their campuses. Of the over 900 campuses in the LAUSD about 150 are relatively new. The other 750 require work and lots of it. At the time the LAUSD told us they had about $7 billion to invest in those 750 campuses and had determined that $70 billion were required to finish the job. That’s on average close to $100 million per campus. It sounds like a lot, and yet were we to invest in LAUSD’s schools in a day what we spent on the war in Iraq in a day we could rebuild every one of the LAUSD campuses in a little more than three months. This is not to say that good school campuses and buildings deliver a good education. People do. But good campuses and buildings do send a message—that we care. Magnolia High School Center for Excellence Phase 1 Cyber Security instruction classroom labs.